Princess Sofia of Sweden and Prince Carl Philip of Sweden welcomed guests to their wedding at The Royal Palace in Stockholm, Sweden on Saturday (June 13). 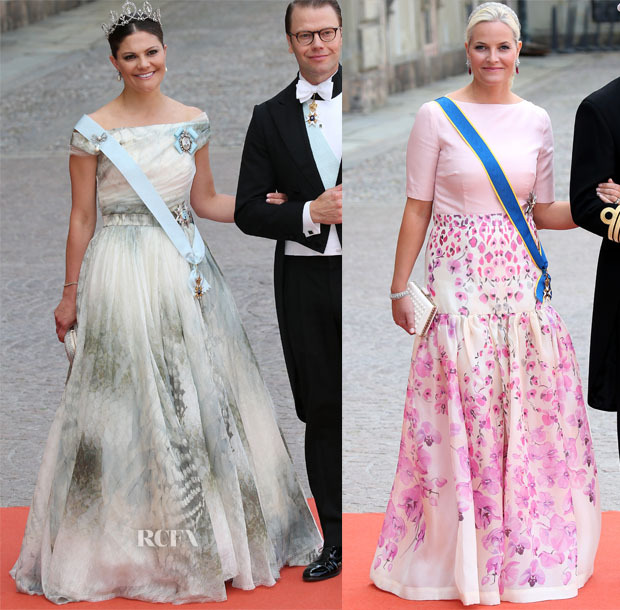 Crown Princess Victoria of Sweden: Escorted by husband Prince Daniel of Sweden, Princess Victoria swept onto the scene in an H&M gown from the Conscious Collection that was most magnificent for its watery, painterly hues that were well-coordinated to her regalia. A decorative Connaught tiara, worn by her for the very first time, added sparkling royal flair to the look. If the dress looks familiar, it’s because Olivia Wilde wore the skirt version at the 2015 Elle Style Awards. Crown Princess Mette-Marit of Norway: Pretty in pink, she brought a wave of feminine, summery spirit in a Temperley London gown most notable for the vibrant orchid print that decorated the ball skirt. Princess Tatiana of Greece: Princess Tatiana had a magical moment in her off-the-shoulder, lavender-gray Celia Kritharioti Haute Couture gown with stunning, all-over beading and embellishment. While the dress was a statement piece, she didn’t overcook it by keeping her hair in effortlessly modern waves and wearing a small, refined tiara. Princess Madeleine of Sweden: Once again showcasing her softly sophisticated maternity style, she wore a pink Elie Saab gown enhanced with flowing sleeves and a beaded bodice. Queen Maxima of the Netherlands: She coordinated her richly jewel-toned, ruby Jan Taminiau illusion lace gown with her striking collection of jewels, which created a vein of consistency throughout the look and prevented it from appearing overly accessorized. I love the whimsical, delicate flowers that accented the dress throughout. Sophie, Countess of Wessex: While her minimalistic, pastel lavender gown was lightly imbued with embellishment at the sleeves and bodice, most of the sparkle came by virtue of her stunning jewels and tiara. Crown Princess Mary of Denmark: The cornflower blue colour of her gown was sublime, so I was sad to see the unfortunate wrinkles across the front. She topped off the dress with the tiara she wore at her own wedding in 2004 for a touch of beautiful nostalgia. Princess Marie of Denmark: Princess Marie couldn’t be missed in her bright minty green Alberta Ferretti dress that would have benefited from a less brashly golden clutch.